Most industrial signage is functional rather than decorative, but the flourishes here suggested something a bit special. Look closer and you see the words ‘Late of London and Paris’. An equally impressive sign is visible from Sunshine Road, partially obscured by a tree. A lot of care went into painting that vintage car on a factory wall. Thousands of motorists drive past every day without giving it a look. 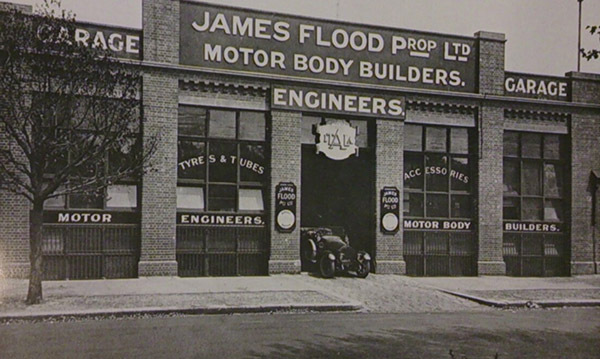 But James Flood was no ordinary car maker. 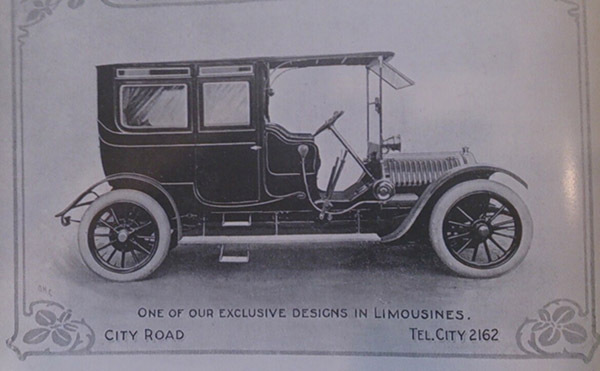 He was a ‘motor carriage builder’ who produced ‘exclusive limousines’. The curious thing is that the signage looks considerably older than the building, a 1950s factory. But the signs, and the cars they depicted, evoked the early years of the 20th century. 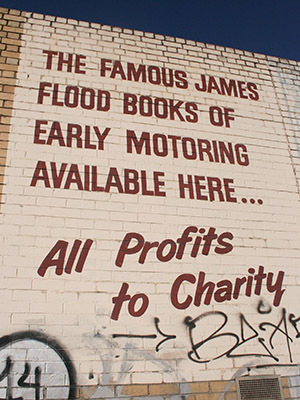 So what was this sign doing here, and who was James Flood? Also on Sunshine Road is this sign, painted in more functional, modern lettering. And another which suggested that Flood’s business involved publishing as well as cars. I tracked down James Flood’s ‘famous’ books at the State Library of Victoria. 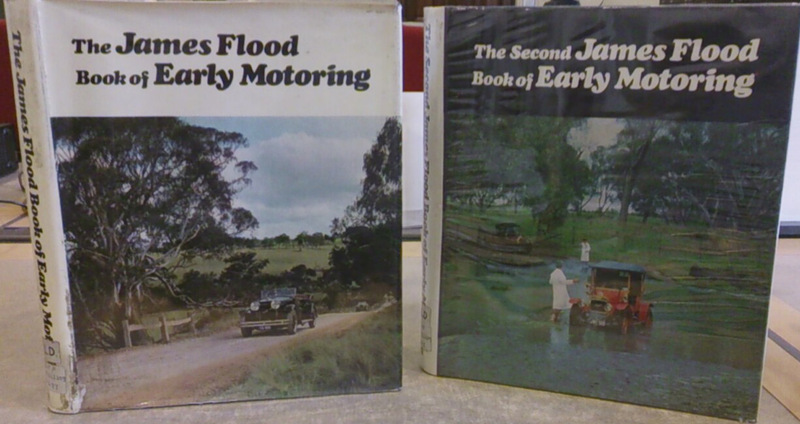 The James Flood Book of Early Motoring was published in 1968 to mark the company’s sixtieth anniversary. A second volume appeared in 1971, a third in 1976. They are big, glossy, heavy, coffee table books, packed with photographs of vintage cars and enthusiastic reminiscences of the early days of motoring. They were edited by the company’s general manager, Harold Paynting, and published by the James Flood Charity Trust, with the profits going to the Royal Children’s Hospital. What interested me was the history of James Flood’s company, covered in the first book. 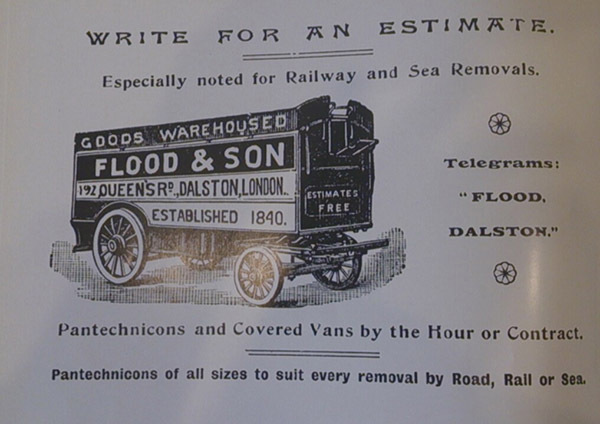 Flood migrated to Australia in 1904 from Essex, where his family had been in the coach-building business. James was apprenticed in coach-building, but had a dream of getting into the new world of ‘horseless carriages’. Arriving in Melbourne, he got a job with one of Australia’s first car makers, Tarrants, but soon left to start his own operation. The factory wasn’t in West Footscray in those days, but St Kilda. This advertisement dates from 1910. Note that it resembles the car painted on the wall. Then, as now, the issue of speed limits was a contentious matter. The police checked the speed of vehicles using the ‘handkerchief method’, which involved measuring how quickly a car travelled between two coppers waving hankies a set distance apart. If a motorist exceeded the speed limit – a reckless 20 m.p.h. – the cops would stuff their hankies in their pockets and leap onto their bicycles for a high-speed pursuit. But speed limits of 20 m.p.h. were quickly eclipsed as motoring technology developed. By the 1920s, Flood’s cars were capable of going well over 90 m.p.h. His company built the bodies for many of the world’s leading makes: Hispano-Suiza, Bentley, Bugatti, Delage, Benz, Lancia, Packard, even Rolls-Royce. Some of these names are now long forgotten by all except vintage car fans: Hupmobile, Chandler, Hotchkiss, Bean. This made Flood a successful and wealthy businessman. He looks very pleased with himself in his personal Hispano-Suiza. The Itala was the jewel in the crown of Flood’s company. 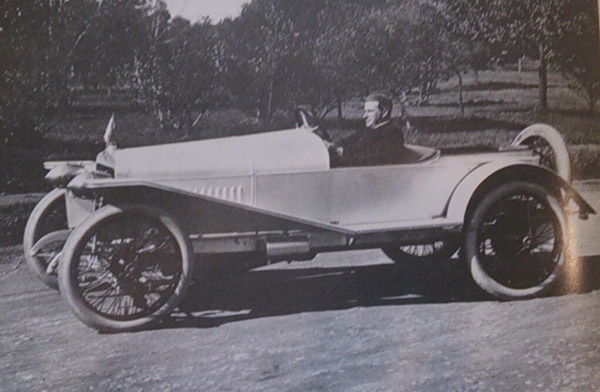 Italas were premier Italian sports cars of the 1920s. James Flood had raced one in the Targa Florio rally, and liked it so much he bought one and brought it back to Australia. The Itala was the consummate racing car, one of the fastest in the world, and Flood’s had exclusive Australian rights to produce it. 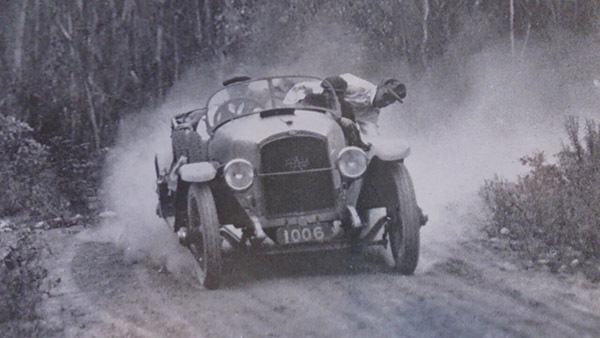 This is what an Itala looked like in action. Not sure why that bloke is leaning out the side. Perhaps to provide balance, or is he making running repairs? 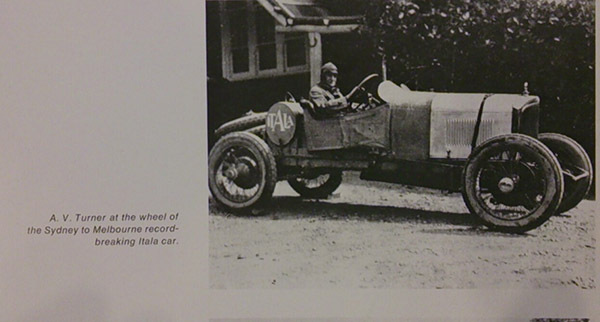 Perhaps the Itala’s greatest moment came in 1924, when an Itala built by Flood and driven by Australia’s most renowned racing driver, Archie Turner (he’s also the bloke racing the plane), with Ossie O’Connor as co-driver, made an attempt on the record time for driving from Melbourne to Sydney (584 miles). Turner and O’Connor’s epic drive was packed with drama, described in detail in The Australian Motorist (1/3/1924) which I summarise below. Turner and O’Connor set off so fast that the speedometer ripped off, and O’Connor spent an hour trying to lash it back to the dashboard. As soon as he did so, the car leapt over a “small ravine”, and the exhaust system also broke off, blasting hot exhaust into their faces “like a breath of Hades”. O’Connor passed out from the fumes, but Turner continued driving, until the speed fell to 50 m.p.h., and Turner could not get it to pick up. He called on the groggy O’Connor to “rip up the floorboards”. They discovered that the throttle was bent and had to be manually straightened. Next the unfortunate O’Connor took a turn at driving, but a bump in the road caused him to stamp on the accelerator so hard that it too broke off. Undeterred, Turner opened the throttle to the max and kept it there for the rest of the trip. Now Turner was back at the wheel, an hour behind schedule, with no accelerator. 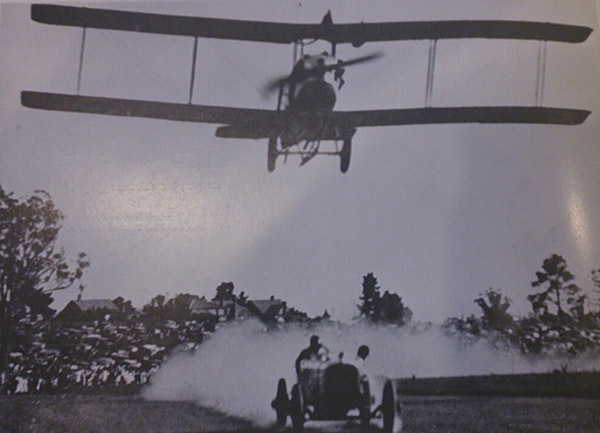 Turner aimed to complete the drive to Sydney in under 12 hours, and a large crowd had turned out to cheer their arrival. But as time ticked past, the crowd became anxious. At last “the blackened, oil saturated crew pulled up.” They hadn’t beaten 12 hours, but they had set a new record of 12 hours 34 minutes. We are told that “Turner took a long drink of tea, while Ossie O’Connor moistened his parched throat with water.” The Itala was said to be “in fine fettle”. 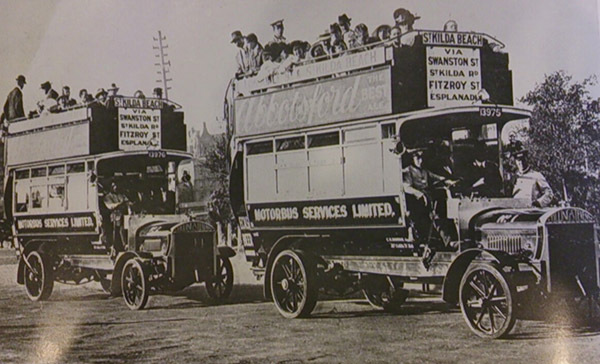 Escapades like that would have earned valuable publicity for James Flood’s business during the golden age of motoring. In the years of the Depression, consumption of luxury cars dropped off, but Flood’s kept going through the years of the Second World War by producing military vehicles. It was a feature of James Flood’s that many employees stayed with the firm for decades. Several staff members clocked up more than 50 years of service. One was Bert Brown, a foreman whose father had been foreman before him. In 1952, the St Kilda premises were gutted by fire, and the company relocated to West Footscray. By the 1960s, the company had moved into the restoration business. As interest grew in vintage cars, the owners of vehicles that had been made by Flood’s brought them back to be restored. 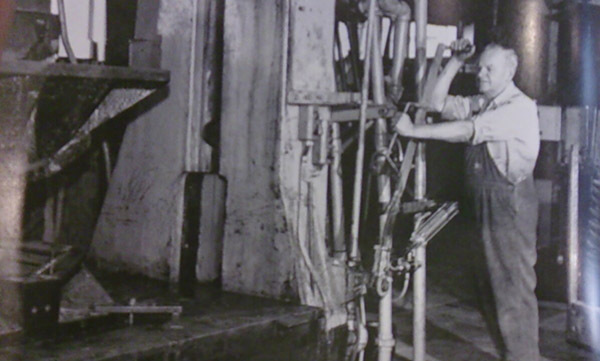 Thanks to the company’s loyal workforce, the men restoring the cars were often the same who had built them 30 years before. 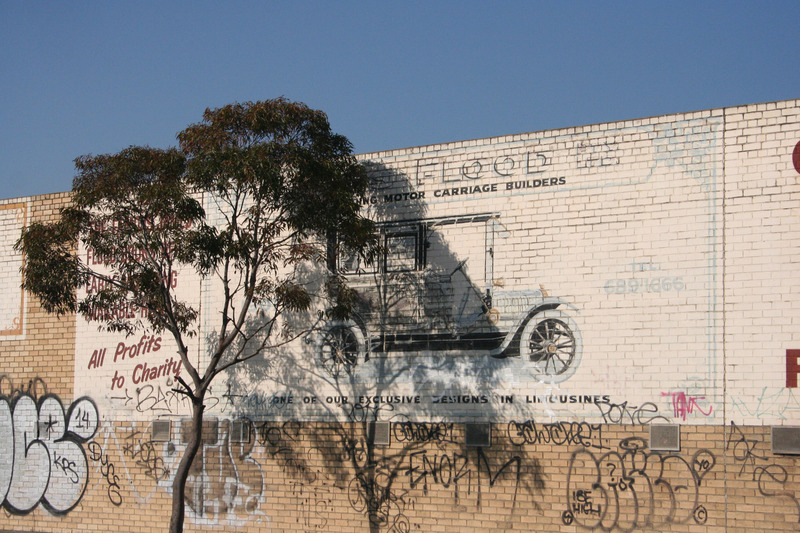 It was to mark the company’s shift from manufacturing into restoration that they chose to brand their West Footscray premises with a vintage sign that emphasised the company’s history. 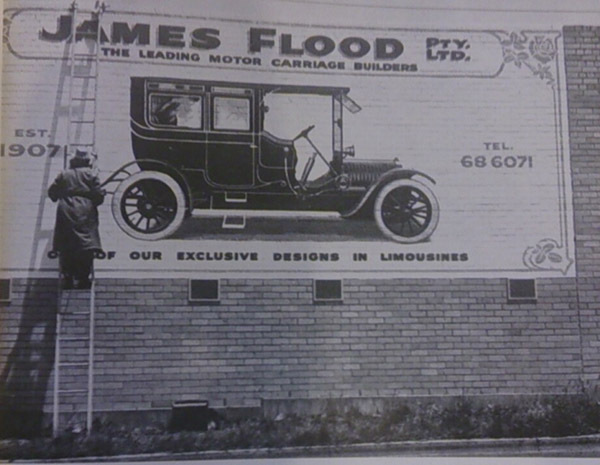 They even brought in a signwriter and artist, James Flett – who had painted signs for the company in the 1920s – to paint a replica on the wall on Sunshine Road. Here he is at work. The sign is now partially hidden by the gum tree, but much of Flett’s handiwork is still visible, as you’ll see if you compare my photo above with this one. I don’t know when Flood’s went out of business – my guess is some time in the 1970s. These days the premises are occupied by Wattyl Paints. The James Flood Charity Trust no longer exists. I imagine there might be a number of vehicles made by Flood still in existence, probably kept in fine condition by members of vintage car clubs. 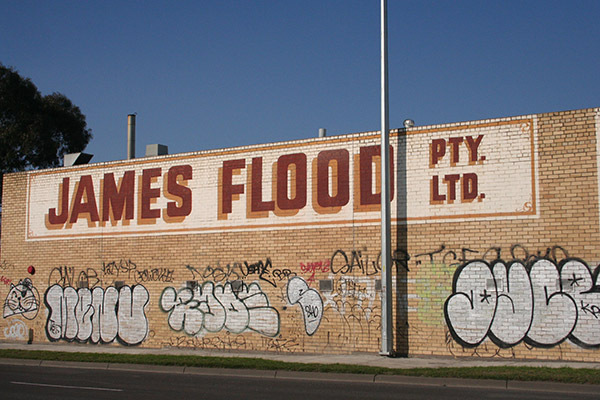 But for many of us, the closest we’ll ever come to the romantic days of James Flood and his stylish machines will be the old painted sign on Sunshine Road, West Footscray. During 1964 I purchased and re-commissioned a 1926 Bean 14 HP, 13,500 miles since new. James Flood body. Photographed for newspaper when I sold it to Floods, then pictured with the workers who actually built the body in 1926. Dread-full car when it cane to performance. I then sought out a 1923 Vauxhall 30-98. Thanks Peter. Hope you had better luck with the Vauxhall! Have you heard of the Flood Coach builders from Bendigo? (migrated from Galway (Ireland) about 1854. Went on to be Floods’ Motor Services with a bus company. Only recently sold out of the Flood family. Glad the flood name is still around , I did my Apprenticeship at West Footscay and they were great days . Read about James William Floods’ wife & children who stayed in England b/c her father said James would not come to any good. A bit sad. It tells of his arrival in W.A. & his coach building business. Read the text from the photo of the newspaper, not the mistyped version. After an accident, I took my car there for one of the 3 repair quotes required by the insurance company. What really impressed me was they wanted to replace various panels with new panels rather than just beating the old ones back into shape. Needless to say, due to being the highest price (for the far superior finish), the insurance company didn’t go for that…pity..! !